Natoli Engineering Company continues its renowned programme of tablet manufacturing training with its autumn 2018 training courses. The industry's top subject matter experts will be joining Natoli for Tablet Development, Scale-Up & Intro to Microtabs, October 8-10, 2018. This course is the inaugural event at Natoli Scientific's new research and development laboratory in Telford, Pennsylvania. Attendees will learn new approaches to formulation development, enhance critical thinking and problem-solving skills, and apply scientific principles to their formulation development. The firm's premier Basics of Tablet Manufacturing & Troubleshooting training will take place October 23-25, 2018, at the Natoli Technical Training Center in St. Charles, Missouri. 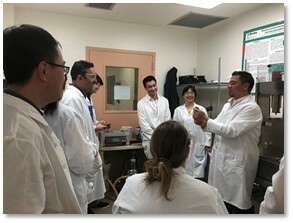 Attendees will learn from and interact with the company's experts and gain an in-depth understanding of the practical and technical aspects of tablet manufacturing and troubleshooting. The Tablet Formulation & Troubleshooting course is coming to Pakistan for the first time on October 23-25, 2018. This course is a unique training opportunity for product development professionals in the pharmaceutical industry. Attendees will be able to talk to Natoli's industry experts about their specific tableting and formulation challenges, test real-world applications of lecture topics, and participate in problem-solving exercises. The company's Tablet Compression Resource facility in Cypress, California, will host Manufacturing Cannabis Tablets: Common Issues, Tips, and Solutions, November 28-29, 2018. In this first-of-its-kind training, industry experts will discuss best practices for producing cannabis tablets, including technologies that can be used to target and modify the release profile of cannabis and demonstrations of the tableting process.